Evergreen trees are in many of our living rooms this time of year. We have a lovely Fraser Fir in ours. They are also popular for landscaping since they stay green all year round. Have you ever wondered why or how? It all has to do with the balance of energy. Many of these trees are found in cold climates and everything about them is adapted to handle tough conditions and take advantage of resources whenever they are available. I think this is the perfect time to explore those amazing adaptations. So what exactly do I mean when I say evergreen? An evergreen tree is just what it sounds like. It’s a tree that keeps its green leaves all year instead of losing them like deciduous trees; maples, elms, cottonwoods. Most of our evergreens are conifers (Figure 1). This means that instead of having flowers and fruit, they produce cones. Even with cedar trees, the blue “berries” are actually a type of cone1 (Figure 2). Weird isn’t it? Often times, there are male trees and females trees. Early in the spring, have you noticed your car covered in yellow-green dust? That’s pollen floating on the wind; hoping to find a female cone. Once fertilized, a female cone may take several years, depending on the species, to mature. Why so long you ask? It’s hard to get all the energy needed to grow seeds in cold/seasonal climates. 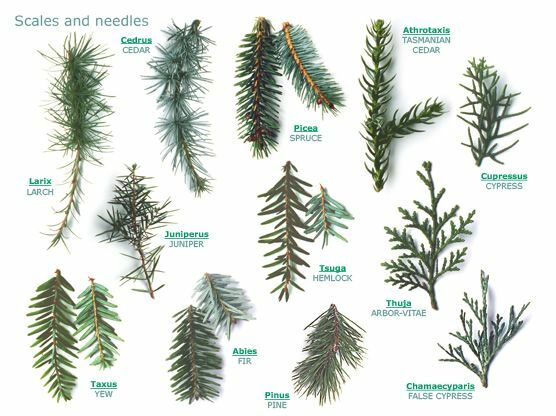 Many of our evergreens have needle-like or scale-like leaves (Figure 3), and even though they keep their leaves year-round, that doesn’t mean they can grow year-round. Resources in the dead of winter might not allow for photosynthesis (the production of sugar from sunlight, water, and carbon dioxide (CO2)), but having leaves all year means they can photosynthesize whenever conditions are good. Very cold temperatures are not good for photosynthesis1, and even though northern trees are better adapted for this, winter temperatures can still drop below a functional level. Also, you may have noticed that winter days are shorter. They are even shorter the further north you go. If there is no sun, there is no photosynthesis or growth. The needle leaves themselves have lower rates of photosynthesis but each leaf can live for several years on the tree. This is a way to balance the decreased availability of resources. Although they photosynthesize at a lower rate, evergreen trees do not have to expend energy making new leaves every year1. Their leaves also help the tree cope with other tough conditions. If you go over to an evergreen and feel the leaf, you will notice that it feels waxy, and you would be right. Evergreen leaves have a thick, waxy coating called a cuticle. This cuticle has pit-like holes in it to allow CO2 in but not let water out. That is very important in dry/cold environments. The cuticle and other tissues in the leaf also keep the water and cells inside the leaf from freezing so the leaf is not damaged even in the coldest of winter days (Figure 4)3. Another way needle leaves help evergreens is that the needle shape doesn’t hold onto snow as well. If you have ever had to shovel it, you know that snow can be very heavy. Imagine having all of that snow in your driveway sitting on top of you. The evergreen tree doesn’t want that either. Their leaves and down-sloping or flexible branches let snow slide off a lot of the time, or their branches are so flexible they bend under the weight instead of snapping (Figure 5). The needles also have another defense, but this one protects against munching animals. Needles don’t taste very good and are hard to digest thanks to different oils and resins. Some animals have adapted to eating them, but overall, it’s a pretty good defense. Evergreens also have to battle fungus and insects too. If you’ve ever touched the trunk of a pine or cedar tree, you’ve probably gotten covered in pitch (Figure 6). This pitch is very sticky and also has anti-microbial properties that help the tree fight off fungal and insect invaders4. So whether you are gazing at the tree in your living room or one in the park, you can look at its branches and leaves and think how tough and resilient that tree is. Absolutely amazing! I’ll be bundled up trying to stay warm, and that tree is still growing and thriving like 15°F is no big deal.